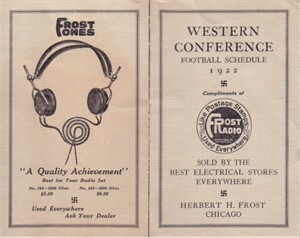 Original 1922 Western Conference (predecessor of the Big 10) college football foldout schedule issued by Frost Radio. Inside are the game dates for all 10 member schools (Chicago, Northwestern, Illinois, Wisconsin, Michigan, Purdue, Ohio State, Iowa, Indiana and Minnesota). Folded size is about 3 1/2 by 5 1/2 inches. Has minor flaws and wear including a couple very light surface creases, but nothing serious.